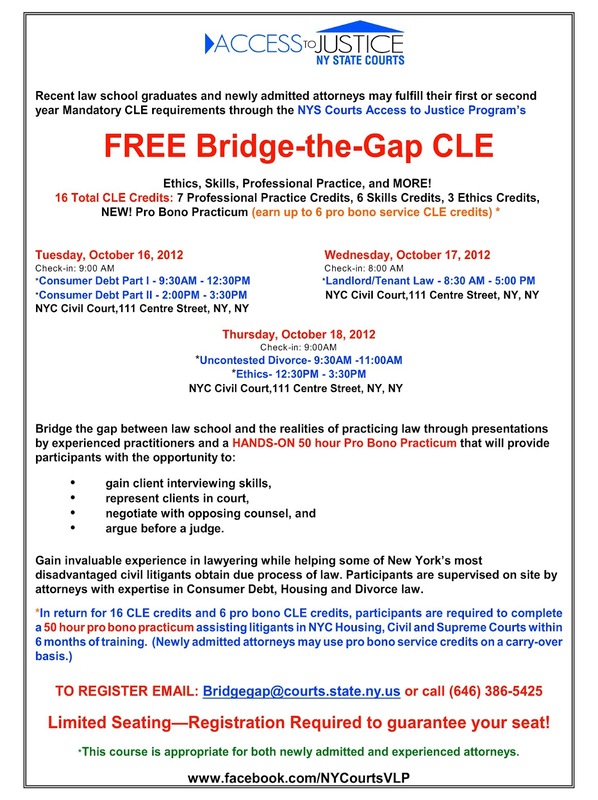 If you live in NYC and have the time and inclination to commit to 50 hours of pro bono service, I recommend signing up for the Bridge the Gap seminars offered by the NY State Courts. The lectures are for both newly admitted and experienced attorneys and give an overview and practical training over the course of three days. 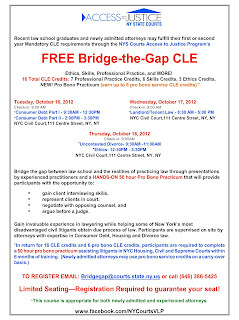 The next session is scheduled from Oct. 16, 2012 to Oct 18, 2012 at NYC Civil Court, 111 Centre Street, New York, NY. Attendees who contribute 50 hours of pro bono will earn 16 CLE credits and 6 pro bono credits. I attended the Spring lectures with my friend Margaret but was late to perform my pro bono work. Since the start of September, I've been volunteering at the No-Fault Divorce Clinic and at Housing Court in Brooklyn. If you should have any questions, contact the CLE office at (212) 428-2105 or toll-free for calls from outside New York City at 1(877) NYS-4CLE. If you aren't ready to commit to pro bono work, you might be interested in signing up with Lawline for their CLE subscription. Lawline is offering a 1-year CLE package for $299. If you're interested, head to www.lawline.com/ny299 or call 1-866-240-9077. This particular package expires on 10/31. I've listened to a several Lawline lectures online. They're undeniably convenient as you can listen almost anywhere and anytime. The lectures vary in their usefulness, I prefer the practical lectures and gravitate towards those covering real estate practice and tax practice. Another good source for CLE is your local bar association. AABANY, the Asian American Bar Association of New York, organizes practical and interesting CLE lectures in the area of real estate practice. Margaret Ling of the Real Estate Practice Group develops and organizes particularly effective and valuable CLEs. The AABANY CLEs are open to non-members for a marginal fee. Can you recommend a solid CLE provider? Where do you go for your CLE needs? I would recommend lexvid for free Online CLE Programs. Over 500,000 attorneys nationwide can earn all of their MCLE credits absolutely FREE at lexvid.com.